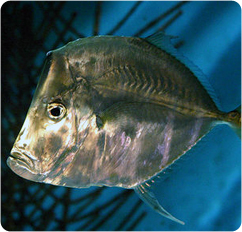 Lookdowns are a large fish that needs plenty of swimming room and relatively peaceful tankmates, as long as they can’t eat them. They do well in groups but single specimens can be kept. They usually don’t eat right away and depending on the size of the fish and the size of the tank that they’ve been placed in, they are usually stressed out and may not eat for quite awhile. Also, because they’re usually placed in small tanks, they can sustain damage to their fins and eyes either from other fish or from hitting pipes or the glass of the tank. This is a fish that really should be kept either by an advanced hobbyist or someone that can give it a large tank where it would be the show piece of the tank.